Marple Township is a township in Delaware County, Pennsylvania, United States. It contains the census designated place of Broomall. The population was 23,743 at 2015. ZIP codes include mainly 19008, but also partially 19064 and 19063. Township is run by Marple Township board of commissioners. President Joseph Rufo, Vice President Daniel Leefson. Portion of 1687 Holme Map. Marple Township is on the righthand side of the map, below Newtown and above Springfield. The Delaware County area was first settled by Quakers who came to Pennsylvania by the Delaware River on September 29, 1683. The ship they used was called the Endeavor. Marple Township was originally settled in 1684 and was recognized as a township in the same year. The original spelling of the township was Marpool, however the spelling was changed to Marple in the Thomas Holme map of 1687. The Marpool spelling may have been an error. One of the settlers that arrived on the Endeavor was Thomas Massey. He obtained a 300-acre plantation in the township from William Penn. The house he built on the land is still preserved today, as well as some of its surrounding gardens. In 1948 Marple Township got its first police station. Before, there was no local branch and no patrols of the police and only a county sheriff. Crimes were mostly settled between victims and perpetrators themselves. Marple became a first class township in 1961. According to the United States Census Bureau, the township has a total area of 10.5 square miles (27.2 km²), of which, 10.2 square miles (26.4 km²) of it is land and 0.3 square miles (0.8 km²) of it (2.95%) is water. The community of Broomall is located in, but is not coterminous with, Marple Township—the township also includes part of the ZIP codes of Springfield and Media. Other villages include Larchmont (also in Newtown Township) and Lawrence Park. Waterways in Marple Township include Crum Creek, Darby Creek, Hotland Run, Springton Lake and Trout Run. As of the census of 2010, there were 23,428 people, down slightly from 23,737 people in 2000. The racial makeup of the township was 89.6% White, 2.1% African American, 0.1% Native American, 7.0% Asian, 0.3% from other races, and 0.9% from two or more races. Hispanic or Latino of any race were 1.3% of the population . The 2000 census showed 8,623 households, and 6,415 families residing in the township. The population density was 2,326.1 people per square mile (898.5/km²). There were 8,797 housing units at an average density of 862.1/sq mi (333.0/km²). The racial makeup of the township was 92.60% White, 1.10% African American, 0.09% Native American, 5.51% Asian, 0.12% from other races, and 0.59% from two or more races. Hispanic or Latino of any race were 0.66% of the population. There were 8,623 households, out of which 30.0% had children under the age of 18 living with them, 64.1% were married couples living together, 7.6% had a female householder with no husband present, and 25.6% were non-families. 22.6% of all households were made up of individuals, and 13.0% had someone living alone who was 65 years of age or older. The average household size was 2.64 and the average family size was 3.12. In the township the population was spread out, with 21.8% under the age of 18, 6.3% from 18 to 24, 24.8% from 25 to 44, 25.0% from 45 to 64, and 22.0% who were 65 years of age or older. The median age was 43 years. For every 100 females, there were 89.4 males. For every 100 females age 18 and over, there were 85.1 males. The median income for a household in the township was $59,577, and the median income for a family was $71,829. Males had a median income of $47,062 versus $32,304 for females. The per capita income for the township was $28,494. About 2.1% of families and 4.6% of the population were below the poverty line, including 3.7% of those under age 18 and 5.0% of those age 65 or over. Marple Township is governed by a Board of Commissioners made up of representatives from each of the township's wards which meets for regular sessions. The current commissioners, by ward, are Joseph Rufo(R-1), Jan Ceton(R-2), Robert Fortebouno(R-3), John Lucas(R-4), John Longacre(R-5), Michael Molinaro(R-6), and Daniel Leefson (R-7). Joseph Rufo currently serves as the board's president. Marple generally leans to the right on the political spectrum. In the 2008 general elections, the township voted Republican for every office except for the General Assembly representative from the 166th district. Along with Aston, Bethel, Chadds Ford, Concord, Edgmont, Middletown, Newtown, Springfield, and Tinicum, Marple was one of the ten Delaware County municipalities to vote Republican in the 2008 presidential election. The county as a whole voted Democratic. Marple Township lies within the Marple Newtown School District. The district has four elementary schools, one middle school, and one high school. In terms of higher education, Delaware County Community College, a public, two-year community college, is also located in Marple Township. The township is also served by the Marple Public Library. Roads serving Marple Township include U.S. Route 1, which passes north-south through the southern part of the township along a freeway; Pennsylvania Route 3, which passes east-west through the northern part of the township along West Chester Pike; Pennsylvania Route 252, which passes north-south through the western part of the township along Newtown Street Road; Pennsylvania Route 320, which passes north-south through the township along Sproul Road; and Interstate 476, which passes north-south through the eastern part of the township along the Blue Route and has interchanges with US 1 and PA 3. SEPTA provides Suburban Bus service to Marple Township along Route 104, which follows West Chester Pike through the township on its route between West Chester and 69th Street Transportation Center in Upper Darby; Route 107, which runs from the Lawrence Park Shopping Center in the township to 69th Street Transportation Center via the Springfield Mall; Route 112, which follows Media Line Road and West Chester Pike through the township on its route between Delaware County Community College and the 69th Street Transportation Center; Route 115, which offers weekday service along Media Line Road and West Chester Pike through the township on its route between Delaware Community College and the Darby Transportation Center in Darby and the Philadelphia International Airport; Route 118, which follows Newtown Street Road through the township on its route between Newtown Square and the Chester Transportation Center in Chester; Route 120, which follows West Chester Pike through the township on its route between Cheyney University and the 69th Street Transportation Center; and Route 126, which runs from the Lawrence Park Shopping Center in the township to 69th Street Transportation Center via Havertown. Marple Township has a system of eleven parks. They are maintained by the municipal government. ^ Neal, Aaron. "Thomas Massey House". ThomasMasseyHouse.org. Retrieved 19 March 2012. ^ Lockhart, Keith. "Delaware County History". Delaware County (PA) History. Retrieved 19 March 2012. ^ Ashmeade, Henry Graham (1884). 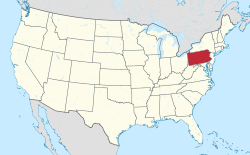 History of Delaware County, Pennsylvania. Philadelphia: L.H. Everts & Co. p. 579. Retrieved 9 June 2017. Wikimedia Commons has media related to Marple Township, Delaware County, Pennsylvania. This page was last edited on 10 January 2019, at 01:54 (UTC).